Courtesy: National Heritage Museum, Lexington, MA. Though they worked in close proximity for years, Alexander Hamilton and George Washington never became close friends; different positions and different personalities prevented it. However, they gave each other things that were perhaps more valuable. In Hamilton, Washington found a brilliant administrator who could help bring order to an unruly army, and later an entire government. Hamilton, in turn, received a shield, a patron who through his rank was able to provide protection from the critics that Hamilton's temparament and policies invariably created. Part of Washington's Military "Family"
From his youth, Hamilton had sought glory; as a frustrated 14-year-old clerk in the Caribbean, he had written, "I wish there was a War." Within two years of his 1773 arrival in America, war had indeed broken out, and Hamilton quickly joined the effort. Hamilton became the captain of an artillery company created by New York's provincial congress. He may have first attracted the attention of Continental Army Commander Washington during the retreat from New York. 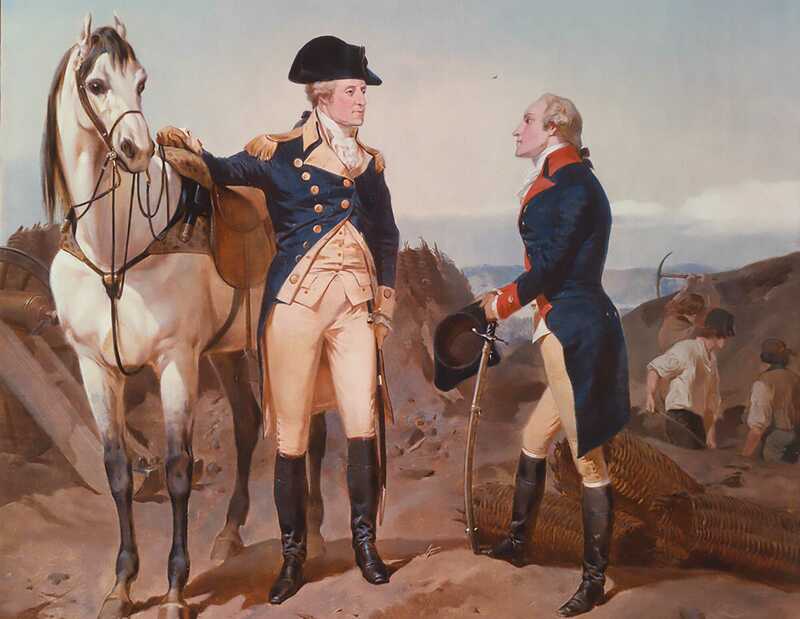 After Hamilton served in the battles of Trenton and Princeton, Washington promoted him to lieutenant colonel and made him aide-de-camp, one of a small circle of staff known as Washington's "family." The aides lived and worked together, developing an easy comradeship and telling nicknames; Hamilton was dubbed "the little Lion." Washington would come to be a father figure to all Americans, but he did not act the part of parent to his staff, preferring to keep a dignified distance. He did, though, seem to show Hamilton special attention. For his part, Hamilton disliked being in a position of "personal dependence" on another man. Their contrasting temperaments prevented any close friendship from developing between the 22-year-old aide and the General, twice his age, whom Hamilton always addressed as "Your Excellency." Washington was prudent and reserved, with excellent judgment. He sought conciliation and accepted compromise. Hamilton was brilliant and decisive, but prone to rashness. When he believed himself right (which was nearly all of the time), he gave no quarter and could not keep quiet. Washington recognized Hamilton's talents and made use of them; as the General told Congress, he needed "persons who can think for me, as well as execute orders." Hamilton could seamlessly interpret Washington's commands, put them into words, and fill in the necessary blanks. And he could do it quickly; Washington's staff sometimes sent out 100 letters a day. The General, who had already achieved the sort of acclaim and stature that his young aide was desperate to acquire, also limited Hamilton's trajectory, refusing his many requests for a field command. That would lead to a rift between them. After nearly four years as another sort of clerk, Hamilton was desperate to break free of Washington's "family." The incident that gave him that chance is almost comical in hindsight; during a meeting in February 1781, Hamilton left Washington's side to deliver a letter, only to be delayed by the Marquis de Lafayette on his way back. He arrived to find Washington glaring down at him from the top of a staircase, declaring that Hamilton treated him with "disrespect." Since you have told me so, Hamilton replied, "we must part," and he resigned his post, refusing Washington's prompt attempts to smooth over the breach. Letters written in the aftermath show an injured young man's venom; for "three years past I have felt no friendship for [him] and have professed none." But Washington still commanded the army that held the surest path to Hamilton's glory, and Hamilton firmly believed in the American cause, so he soon returned to duty, eventually receiving the field assignment he so desperately wanted and leading a successful assault on the British position at the decisive battle of Yorktown. Hamilton left active service a mere two months later, and for a few years his correspondence with Washington became sporadic. But Hamilton's legal and financial achievements in the 1780s, as well as his key role in the authorship of The Federalist, did not escape notice, and after becoming the nation's first president in 1789, Washington tapped Hamilton to be his Treasury Secretary. This time, perhaps because Hamilton occupied a less subordinate position and Washington made no claim to extensive economic knowledge, their collaboration truly flourished. 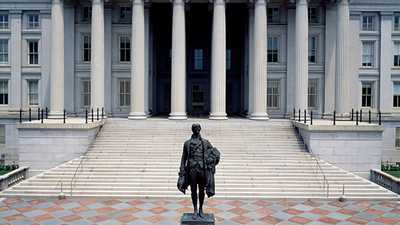 With Washington's support, Hamilton acted as de facto prime minister for the new government, running both the Treasury and Customs Service and convincing the president to approve ideas, like a national bank, that were bitterly opposed by other Cabinet members. The president's popularity provided Hamilton with cover from critics who otherwise might have been able to sabotage his policies. Even after he left government service, Hamilton continued to work with Washington, drafting much of Washington's celebrated farewell address. An esteem grew between the men, even if it never rose to great personal warmth. During the height of popular scandal over the 1797 public disclosure of Hamilton's affair with Maria Reynolds, Washington sent his former aide wine and his expression of "sincere regard and friendship." A year later, when Washington was made head of the U.S. Army during a period of growing tension with France, the general conditioned his acceptance on Hamilton's being appointed second-in-command. Washington's death in late 1799 left Hamilton increasingly alone and vulnerable to political attacks; "he was an aegis very essential to me," Hamilton candidly wrote, and he would suffer without the great man's protection. 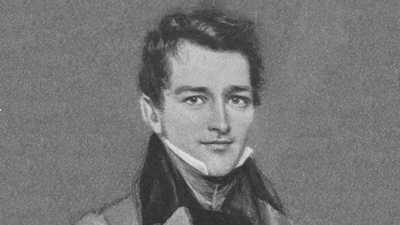 Hamilton's eldest son and proudest hope for the future, Philip died in an ill-considered duel at the age of 19. 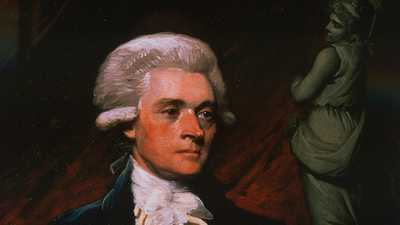 On a June evening in 1790, Jefferson hosted a dinner party to broker a critical deal between Madison and Hamilton. One of Hamilton's most important contributions to the emerging American economy was his successful advocacy for the creation of a national bank.